An omni-directional aerial / antenna that receives TV signals through 360 degrees using an electronic amplifier to boost signals. 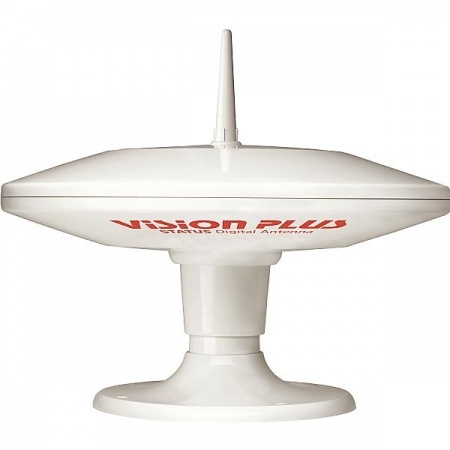 Designed for mobile use, the Vision Plus STATUS 335 TV aerial satisfies a number of important criteria, whilst overcoming some of the compromises associated with this design of antenna. In the UK and a number of overseas countries TV signals are transmitted horizontally and vertically. 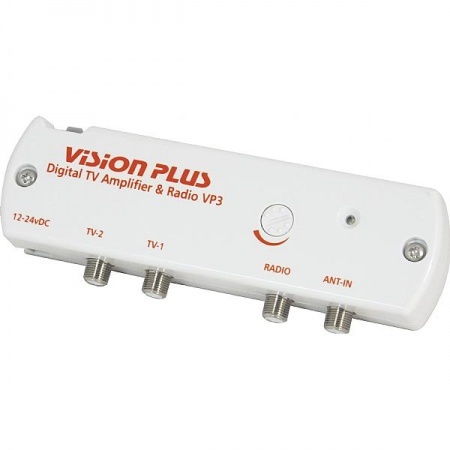 Vertical reception requires a vertical receiver. The 335 achieves this with the Central Pinnacle. A clever solution which creates a distinctive profile setting it apart from the rest. TV reception can be greatly affected by the orientation of the antenna and it is crucial that all antennas are mounted level. Therefore the 335 has the ability to be finely adjusted to remain level on gradients up to 22 degrees - a unique feature only offered by STATUS. The 335 is available in two models depending on your particular installation. Both are designed to be versatile, offering three fitting options as standard - Permanent Fitting - 25mm Mast Fitting and Suction Pad Fitting. The Permanent option can even be mounted over a small locker, as well as a wardrobe. The 2075/5/VP3 has 5 metres of coaxial cable and the 2075/10/VP3 has 10 metres. For ease of use the Pinnacle can be simply unscrewed in those instances where storage height is a problem. Furthermore, the antenna itself can be removed leaving in place the Mounting Foot, which can be sealed with a blanking cap. The 335 has a proven track record of being the countries most popular Omni-Directional Antenna. By combining the latest in technology and design we believe we manufacture the best all round Omni-Directional antenna on the market today. And finally - Operation - it couldn't be simpler. Simply switch on your television and tune in.